Your video backgrounds can be as important to your video as the actual content itself. Distractions! There are many things which go into creating a new video and making it as attractive as possible. In this blog, and the video that goes with it, we will discuss what is going on behind you. If you don’t think your video backgrounds matter, take a look at your television screen. It’s why cable news channels and interview shows spend hundreds of thousands of dollars to build impressive sets. So let’s all make sure OUR backgrounds are as professional. Where do you place your video camera? In our office we have two places we shoot our videos. The first is in our radio show studio. It is also set up with lights and three back drops: black, white, and green screen. The second is our ‘War Room’ where we work with clients. If someone else owned our house, it would be their living room, but we put our conference table, some comfortable chairs and 3 very large white boards and see through blinds. These blinds allow us to use the light in the room and to have a light background of the red rocks behind us while both stay in balance. Whether you are shooting in your kitchen, your office, or any of your public spaces, pay strict attention to what is behind you. Plain walls are the best, though many people also use a filled bookcase with few nicknacks. We have heard from many people that they look at the books on the bookcase to try and get an idea what you are like. For your video backgrounds in your library, beware, or plan ahead for what they will be reading in your video backgrounds. Which video camera do you use? If you are using your laptop camera, make sure that the camera is at your forehead level so you do not get a POV of an ant looking up at a giant. You should also know that turning your laptop and your camera just a little bit can make a huge difference. If your camera is pointed up, the lines of the wall – ceiling convergence can be striking and distracting. Pay attention to those angles. If you turn your computer the wrong direction, you can have the sharp angles of walls that make your video look busy. Where are you in the videos frame? Another important point for your video backgrounds is the placement of your head in the frame. Make sure that there is nothing growing out of your head, like part of a wall or a post. Tree limbs and branches, if you are outdoors or even if they are on the outside of the window, make you look funny. Shelves from your bookcase can seem to cut your head in half. What's on the wall behind you in your videos? If your video backgrounds are a wall and you have lots of awards on the wall behind you, they will give you 3rd party validation, but they are very busy. Your viewers will not pay as close attention to you because, like the books in your library, they will wonder what the awards are for and to whom they were awarded. If there are two of you in the same video shot, sitting next to each other, take some practice shots to make sure you are both in the shot. Most of the time, we have to sit knee-to-knee so the side of the video does not cut off our heads vertically. This is one time when your video background may not be as important because with two of your in the shot, there is not as much space in the frame. Instead of using a video camera, I love using an online tool like Google Hangouts to create my videos. The benefit is that the upload time is almost nothing because Google has built the filters into its Google Hangout product. If you are using an online tool where you can determine which camera is dominant, pay attention to which camera stays in the large screen at any one time. Don’t forget to click back and forth if you do not use the automatic feature. At the end of the video, you also must click to the view of you before you sign off. Remember, too, that if there are two of you in different places, your video backgrounds are doubly important because there are two of them that are bouncing back and forth in the viewer’s eyes. What is your lighting like in your videos? The lighting you use can be very important. Fluorescent lights and natural sunlight cast different parts of the light spectrum. Be certain to set your camera the proper light so you don't look very green under your indoor lights. Also, severe shadows can put a line right down the middle of your face if you are outdoors. 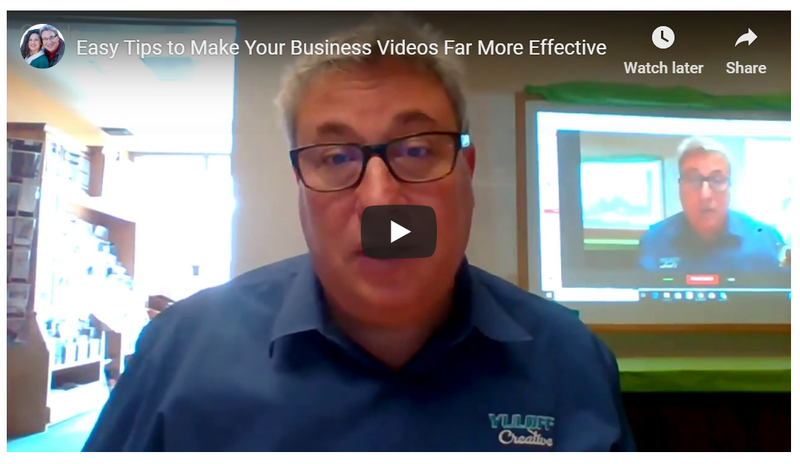 When you want help preparing your videos, or any part of your marketing, you are invited to connect with us at www.FreeMarketingConsultation.com for a 30-minute breakthrough session.